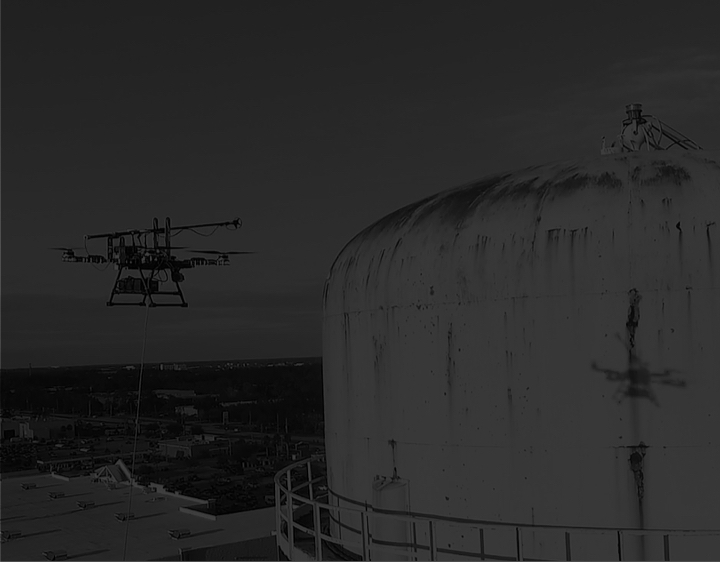 Measure wall thickness of industrial structures in a safer and more cost-effective way with the Apellix autonomous UT drone. Contact us about contact based UT testing at heights. View our video “its all about the data”. Improve speed and safety of DFT measurement acquisition using an Apellix autonomous DFT drone. Contact us about contact based DFT testing at heights. View the video of our cloud base dashboard with the data. We are currently developing bespoke aerial robotic (drone) spray painting solutions for our partners. Both umbilically tethered with the paint, power and compressor on the ground and tetherless with a reservoir for coatings and other materials onboard the aircraft. We are conducting feasibility studies and developing bespoke aerial robotic (drone) spray cleaning systems for our partners including tethered and tetherless systems. Apellix develops elegant transformative solutions to keep workers safe. Our patented software and sensor arrays control precision flight to perform a wide range of tasks currently too expensive or too dangerous for workers.Contact us so we can learn more about how we can be of service. We can be reached via e-mail info@apellix.com, phone +1-904-647-4511, or by completing the form below.